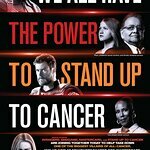 The lineup of celebrities participating in Stand Up To Cancer's fifth biennial telecast on Friday, Sept. 9 (8:00-9:00 PM ET/PT / 7:00 PM CT), got longer this week with the addition of Viola Davis, Jon Hamm, Kristen Wiig, Ed Helms, Zach Galifianakis, Matt Bomer, Dave Franco, Sonequa Martin-Green, Rob Riggle, Tony Hale, Terry Crews, Mel B and Bree Turner. They join an already impressive list of stars committed to the hour-long show, including Ben Affleck, Matthew McConaughey, Emma Stone, Anna Kendrick, Josh Gad, Niecy Nash, Eric Stonestreet, Alison Sweeney, Ken Jeong, Marcia Cross, Greg Grunberg, Danielle Campbell, Charlie Wilson, Brittany Daniel and SU2C co-founder Katie Couric, with special musical performances by celebrated recording artists Celine Dion and Dierks Bentley, who will join Keith Urban and Little Big Town. Some of the newly announced stars will have an opportunity to interact with the public, via the SU2C phone bank and across social media. Additionally, SU2C is harnessing its digital presence by rallying the public through its #reasons2standup campaign. Leading up to and on the night of the telecast, Stand Up To Cancer is encouraging its supporters to share the reasons they have been moved to join in the fight against cancer by sharing photos and videos on social media with the hashtag #reasons2standup. Bradley Cooper, Academy Award-nominated actor and founder of the Bradley Charles Cooper Foundation, will executive-produce the broadcast alongside renowned live event producers Done + Dusted, in collaboration with Stand Up To Cancer’s production team. Stand Up To Cancer (SU2C) is a program of the Entertainment Industry Foundation (EIF). The telecast will broadcast live from The Music Center’s Walt Disney Concert Hall in downtown Los Angeles. ABC, CBS, FOX and NBC, along with American Forces Network, ASPiRE, AUDIENCE Network, Bloomberg TV, Bravo, Comedy Central, Discovery Life, E! Entertainment, EPIX, ESPNEWS, FM, FS2, Fusion, FXM, Great American Country, HBO, HLN, ION Television, LMN, Logo, MLB Network, National Geographic, Pivot, RLTV, SHOWTIME, Smithsonian Channel, STARZ, STARZ ENCORE, TBS, Tr3s, VH1 and WGN America are donating one hour of simultaneous commercial-free primetime for the telecast. For the first time, there will be a Spanish version of the Stand Up To Cancer telecast airing nationally on Galavision, HBO Latino, STARZ ENCORE ESPAÑOL and Univision Deportes, and locally on Univision Puerto Rico. In addition, the show will stream live on SU2C’s Facebook page, Yahoo, SU2C’s YouTube page, MLB.com and in Spanish on Univision.com. USA Network will air the Stand Up To Cancer telecast on Friday, Sept. 9 at 11:00 PM- 12:00 AM ET/PT / 10:00 PM CT. The entire telecast will also become available to stream on Hulu beginning Saturday, Sept. 10. The first four SU2C telecasts took place on Sept. 5, 2008, Sept. 10, 2010, Sept. 7, 2012, and Sept. 5, 2014, and were made available to more than 190 countries. The first Canadian-inclusive SU2C telecast aired in 2014, and this year’s show will again air across all four major English-language Canadian broadcasters: CBC, City, CTV and Global. Additionally, Canadian services AMI, Bloomberg TV Canada, Blue Ant Media, CHCH, CHEK, Fight Network, Hollywood Suite, Joytv, NTV and TLN Television will also air the telecast, the show will stream live on Yahoo Canada and it will be available on-demand on shomi and Telus Optik TV in Canada. To date, more than $370 million has been pledged to support SU2C’s innovative model of collaborative cancer research. Since launching in 2008, Stand Up To Cancer has brought together more than 1,200 of the best and the brightest research scientists from 144 leading institutions in seven countries to fund 19 “Dream Teams,” and six translational research teams; as well as 36 early-career, innovative scientists carrying out high-risk, potentially high-reward projects. The research is aimed at ending cancer’s reign as a leading cause of death worldwide. SU2C-funded researchers have planned, launched or completed more than 160 clinical trials involving more than 9,000 patients. Work by SU2C-supported researchers has led to FDA approval of two treatments. The American Association for Cancer Research (AACR), the world’s first and largest professional organization dedicated to advancing cancer research, is the official Scientific Partner of Stand Up To Cancer. In the United States, AACR is responsible for administering the grants and providing scientific oversight in conjunction with the SU2C Scientific Advisory Committee (SAC). As SU2C’s founding donor, Major League Baseball has provided both financial support and countless opportunities to build the Stand Up To Cancer grassroots movement by encouraging fans worldwide to get involved. In addition to MLB, SU2C’s “Visionary” donors include Bristol-Myers Squibb Company; Cancer Treatment Centers of America; Genentech, a member of the Roche Group; MasterCard; and The Sidney Kimmel Foundation. Major donors and collaborators include American Airlines, American Cancer Society, CVS Health, Fifth Third Bank, The Lustgarten Foundation for Pancreatic Cancer Research, Merck and Rally Health. Other key supporters and collaborators include Cancer Research Institute, Cancer Research UK, Dutch Cancer Society, Farrah Fawcett Foundation, The Laura Ziskin Family Trust, Lilly Oncology, Melanoma Research Alliance, National Ovarian Cancer Coalition, Ovarian Cancer Research Fund Alliance, The Parker Foundation, Prostate Cancer Foundation, St. Baldrick’s Foundation and Van Andel Research Institute.